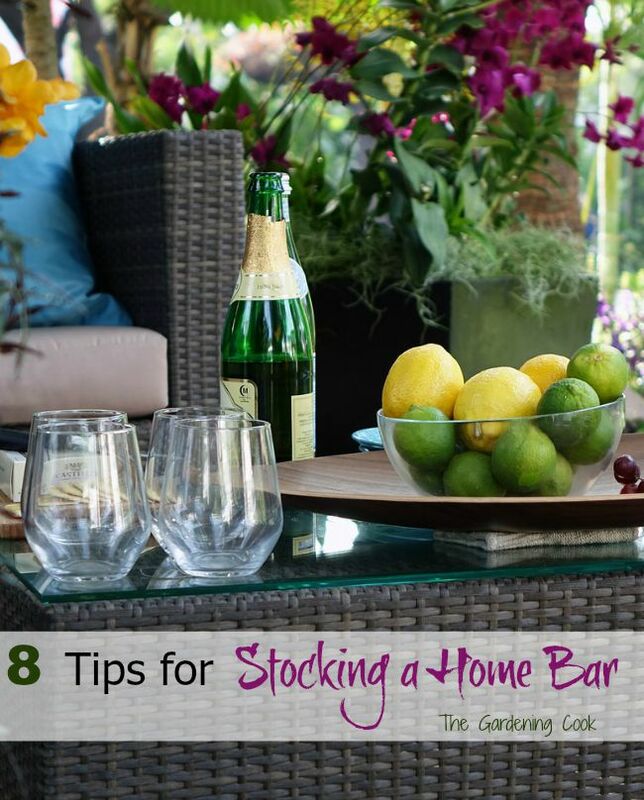 Follow these Tips to Make Sure that you Have a Well Stocked Home Bar. Remember the days when Happy Hour was the highlight of the week? Celebrating with friends over to share cocktail recipes is a fun thing to do. But with the busy lives that we all lead now, going out for Happy hour is not something that happens too often, at least for me. 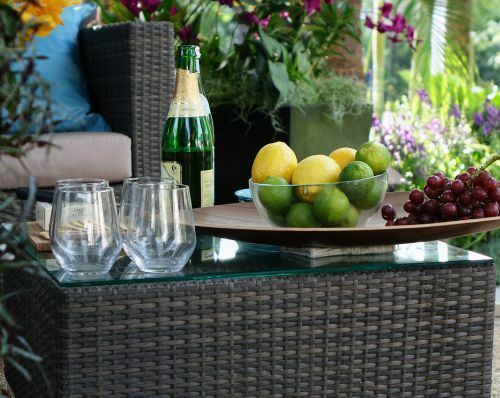 How about having happy hour at home instead? Having a well stocked home bar is helpful for those times you want to call your friends over for an impromptu happy hour at home. This does not have to be an expensive task. A few good bar tools, and the right combination of spirits and mixers are the key. And you don’t need to actually have a bar to keep spirits in. 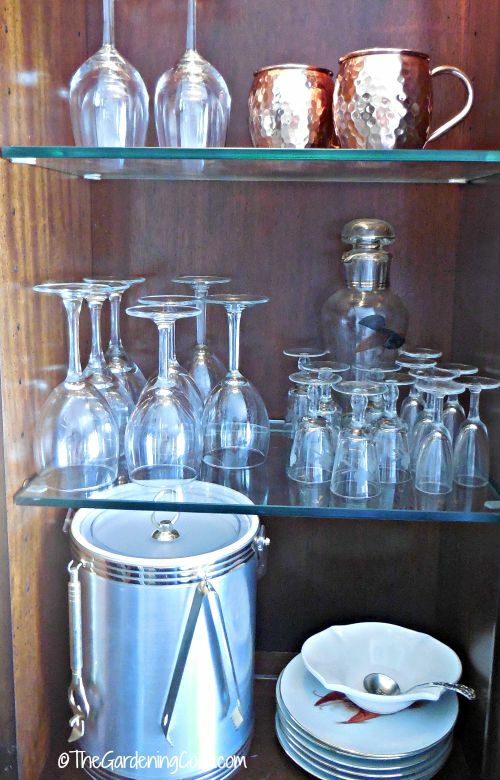 I have a couple of shelves of my dining room hutch that holds bottles of alcohol that I’ve purchased from time to time as well as my collection of glasses and mugs. Spirits last a really long time. Most spirits usually have a high enough proof that their alcohol content will preserve them indefinitely. Those with cream in them, such as Bailey’s and Kahlua are some exceptions, but I like those so much they don’t last long anyway! And of course, you will need a few good recipes that you know well. 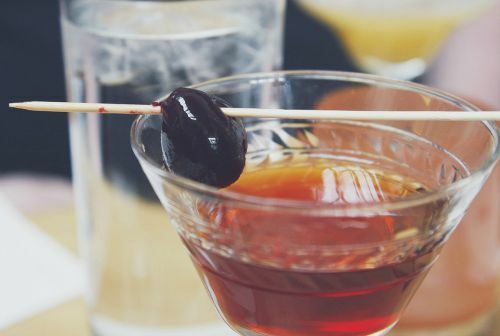 Here are a few things that any well stocked home bar should consider having on hand. 1. Pick spirits that you enjoy yourself. 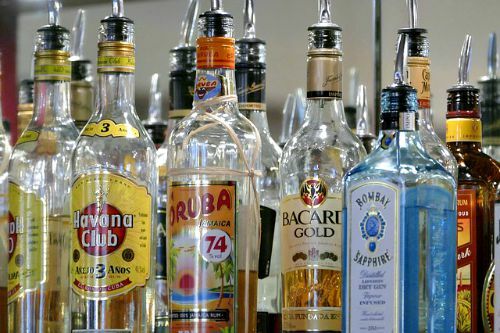 If you try to have everything that any guest would ever want on hand but the spirits are those that you don’t often (or ever) drink, you will spend a fortune and they will take up a lot of room. Choose the ones you like, and add a few that are mainstays in any bar, if you don’t, and your friends will be covered. This tip is for those who only entertain now and then. If you are a regular party giver, you may want to expand on the amount and types of spirits that you keep on hand. I love Southern Comfort and Caribbean Rum, so I always have this in the house. Gin is not a favorite of mine, so I normally pick up a small bottle if I know a guest really likes it. 2. Top shelf is good but… I like a top shelf spirit as much as the next person, but stocking a home bar with all top shelf liquor will get very expensive in a heartbeat. Many medium tier spirits are very good too. Experiment a bit with them until you come up with some that are not bank busters, but still taste great. Remember too that it’s not always about price. 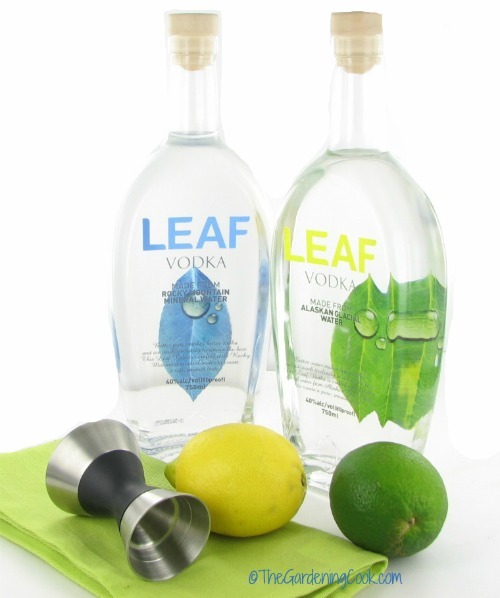 I recently tested some Leaf Vodka for a sponsor and it is moderately priced and I love it. 3. Start Small. Choose a few mainstream good quality spirits and slowly add from there. Adding them all at once is cost prohibitive and if your guests are like mine, they love to experiment with new tastes anyway. Try to get these first and then add to them as funds allow, and as you find you need them. Fresh lemons and limes. I always keep these on hand for cooking, so I have them at party time too. Simple syrup: You can buy a prepared version, or make your own by mixing equal parts water and sugar over heat—it will keep for several weeks in the refrigerator and is easy to make on party day if you don’t have it on hand. Bitters: Some drinks call for bitters. A traditional one is Angostura bitters. Having it on hand will give you the most versatility. Club soda, tonic water, cola, or ginger ale. I also have diet soda on hand too, since many of my friends want it. Fresh Juices – orange and pineapple juice are the most popular and are also good for breakfast. 6. Invest in a few good bar tools. They are not terribly expensive but make all the difference to a cocktail. You can take out a mason jar to shake a cocktail but wouldn’t you really rather do it in a cocktail shaker? Here are some tools to have in your bar. Jiggers. These measure the amount of alcohol needed in the drink easily. They come in several sizes. I have one that flips over, to measure from 1/4 to 1 oz on one end and from 1/3 oz to 1 1/2 oz on the other side. It has markings for most combinations between the two sides. Cocktail shakers. There are many types of these. One type is a Boston shaker which is a metal tin that has an accompanying mixing glass. There is also a shaker/strainer that has a flat top and strainer. Both work well. The choice is yours. Muddler. 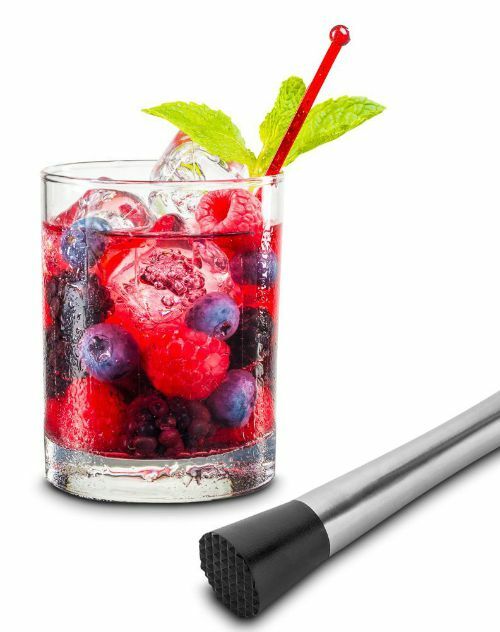 This tool allows you to muddle citrus fruits, herbs & other ingredients the drinks you want to make and assures great flavor in your cocktails. Bar Spoon. This nifty spoon has an elongated shaft that allows it to mix and stir in deep glasses. Hawthorne strainer. 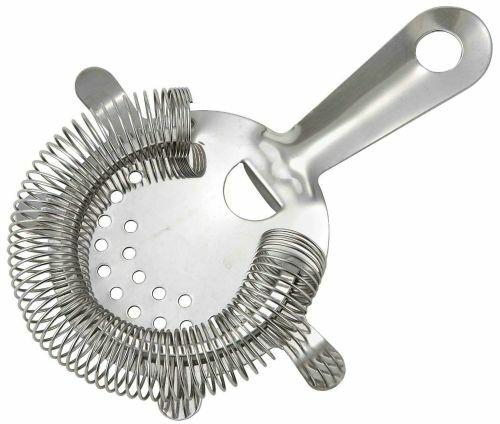 This type of strainer is very popular with bartenders. it consists of a flat disc which is attached to a coiled spring. The spring works by trapping large chunks of ice and other solid ingredients such as muddled fruit or fresh mint leaves. Citrus Peeler. Most cocktails are garnished in some way. A citrus peeler will easily remove a long strip of peel that can be rolled and added as a garnish. Citrus Press. Since cocktails are often mixed with lemons or limes, having a citrus press handy will be a great help for making the drinks. Alcohol spouts. Not totally necessary, but for the price, they give an air of authenticity to the home bar. Corkscrew. This goes without saying but I thought I would add it to the list, just i case. It’s hard to get into a corked bottle without a corkscrew! 8. Glassware and other items. Yes, you can put any drink into any glass, but serving a margarita in a margarita glass, or a Moscow mule in a copper mug, adds mood to the party and makes guests feel special. Once again, start small and add as you can afford them. 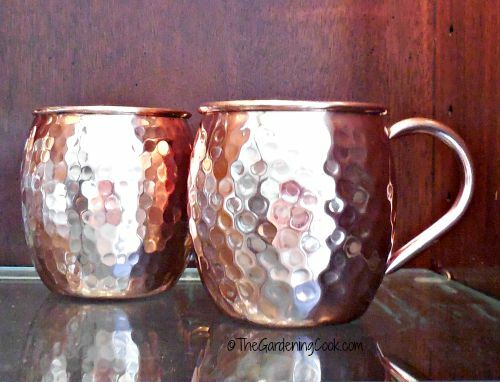 Mugs – I love these copper mugs. They hold the cold in drinks so well! It is also good to have on hand some toothpicks, a supply of napkins and perhaps a stash of small plates that can be used for appetizers and nibbles. 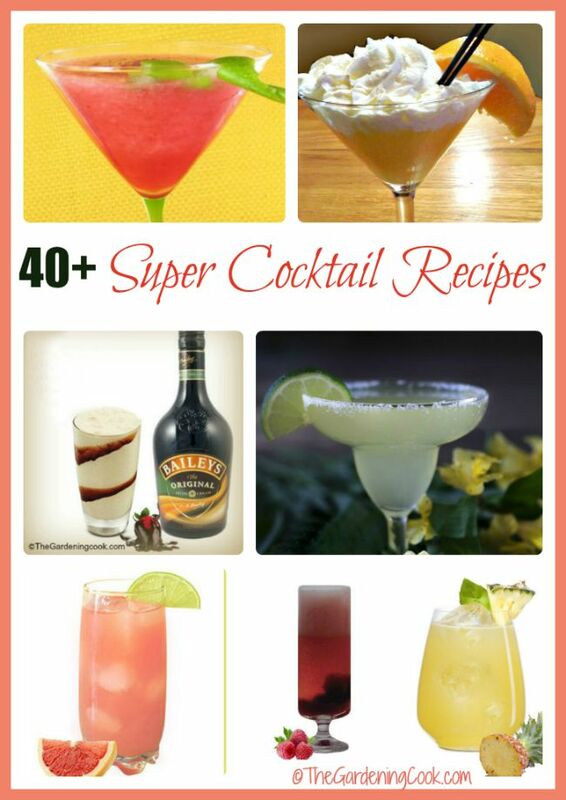 Now that you know what to have on hand for a well stocked bar, how about a few great cocktail recipes that you can practice on until you get really good at them? That will impress your guests for sure! 1. Classic Tequila margarita with lime. 2. Caribbean Coconut Rum and Pineapple Juice. 4. Bailey’s Irish Cream Mudslide. 6. Apricot and Cherry Breezer. 13. Melon Gin and Tonic. 15. Coconut Ginger Lime Margarita. 21. Strawberry and Peach Sangria. 25. Fresh Strawberry and Lime Tom Collins. 27. Orange Creamsicle Pina Colada. 29. Champagne Cranberry Cocktail Recipe. 30. The Best Sangria Recipe. 31. Cointreau and Whiskey Cocktail. 32. Rose Sangria for a Party. 35. Southern Comfort Southern Breeze. 39. Cafe Rio Copycat Mint Limeade. 42. Sweet Southern Strawberry Iced Tea. Also be sure to head over to my sister site Recipes Just 4u. 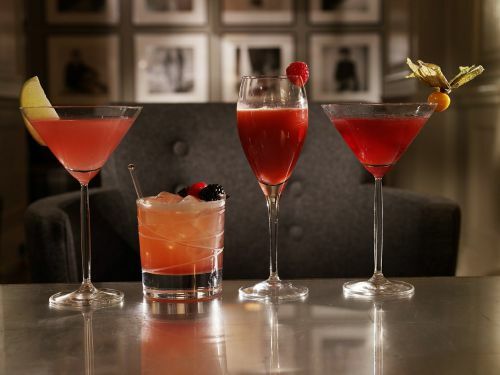 I’ve written another article there on how to make a great cocktail. 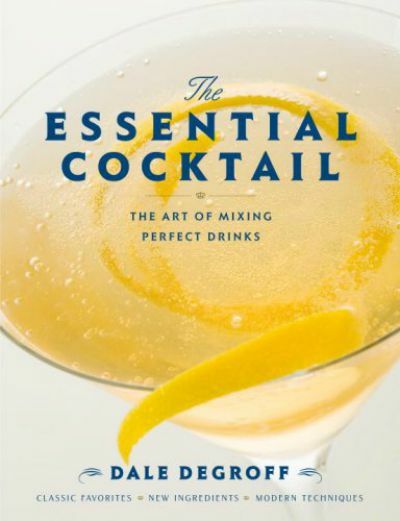 It gives lots of great tips for perfecting the cocktails you try to make. Images not watermarked are public domain photos from Pixabay. See my article on other photo sharing sites here. 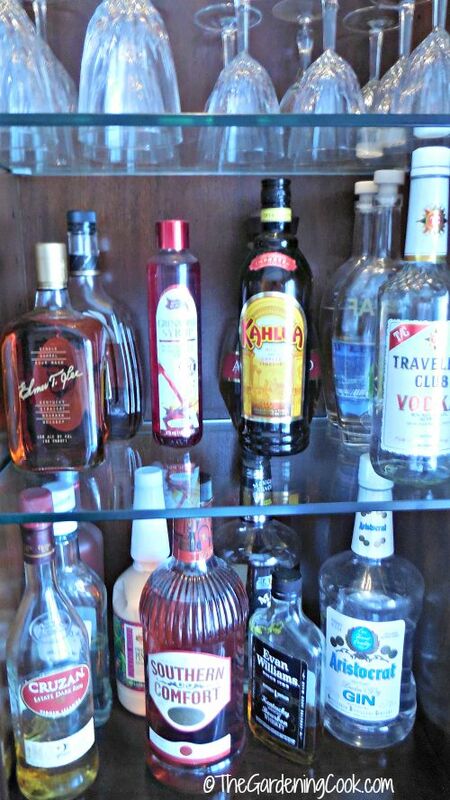 Do you have a stocked bar in your home? What do you think you must have and what could you do without?